BIG SAVINGS! The easiest way to secure your home or office and bring a little peace of mind! Easy-to-install alarm alert system lets you know if your doors, cabinets, or windows have been opened by letting out a 90 db piercing alarm sound. 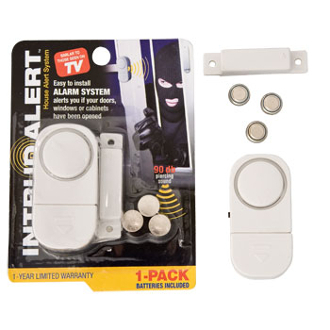 Alarm System is easily activated/deactivated with an on/off switch, and runs off 3 included button-cell batteries.